Caption: This mosaic assembled from Phoenix images shows the spacecraft’s three landing legs and patches of water ice exposed by the landing thrusters. Splotches of Martian material on the landing leg strut at left could be liquid saline-water. Larger version on Spaceflightnow.com .Credit: Kenneth Kremer, Marco Di Lorenzo, NASA/JPL/UA/Max Planck Institute and Spaceflightnow.com. If the miraculous happens and contact is unexpectedly re-established with NASA’s Phoenix Mars Lander, science could flow almost instantly if the ships vital operating systems are healthy. Indeed a science plan could be swiftly put in place after determining the condition of the lander, says Doug McCuiston, director of Mars Exploration at NASA Headquarters. McCuiston explained to me in an interview that the initial science would be “a surface change and atmospheric imaging campaign that could begin nearly immediately. In that instance, if the cameras are operable it is easy to begin an imaging campaign with real-time planning”. A robust and wide ranging science agenda far beyond pictures could theoretically be implemented if Phoenix does amazingly survive and the pre-programmed Lazarus mode kicks in and she re-awakens with a functional arm. The goal would be to restart the assessment of habitability in the martian arctic where humanity in the form of a robotic surrogate first touched water beyond earth. The two principal science instruments, TEGA and MECA, each have unexploited analysis cells which could potentially be loaded with fresh martian soil samples and checked for signatures of water, organics and nutrients. Peter Smith, Phoenix Principal Investigator from the University of Arizona, confirmed to me that the single unopened TEGA oven could be used, if still intact. The one remaining MECA wet chemistry cell could also potentially be utilized. Michael Hecht, lead scientist for MECA at JPL, told me that “in theory” fresh soil samples could be dropped as well onto the two microscope slides that were initially used for atmospheric air-fall samples rather than dirt droppings. High powered examinations with both the optical and atomic force microscopes might also resume. High resolution panoramic pictures would be taken by the stereo imaging system. Close up shots could be snapped by the robotic arm camera. See my Phoenix mosaics here in prepared in collaboration with Marco Di Lorenzo. Caption: Farewell view of TEGA science instrument to Sol 142. 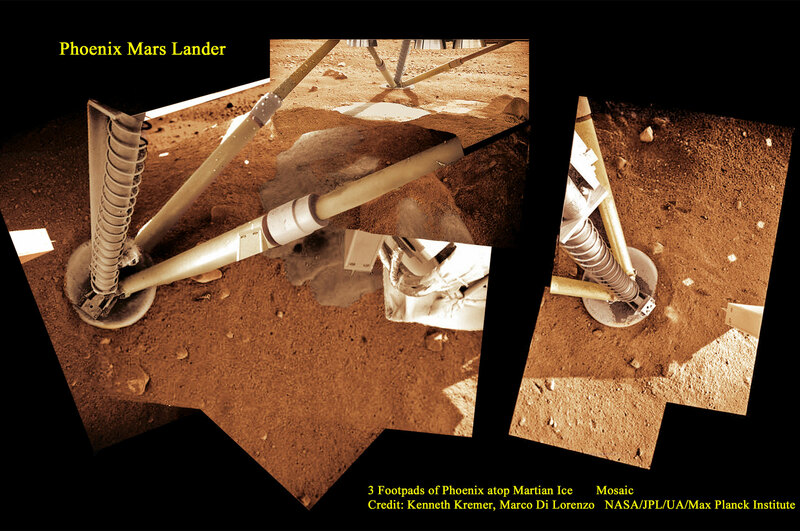 Scoop delivers Martian dirt for compositional analysis. Two MECA cells at top left. TECP probe at top right. Mosaic of images in false color stitched from robotic arm camera images. Credit: Marco Di Lorenzo, Ken Kremer, NASA/JPL/UA/Max Planck Institute and Spaceflight magazine. In fact, no one on the team really expects Phoenix to revive following the exceedingly harsh winter weather she has had to endure since falling silent more than one year ago on November 2, 2008. “Keep in mind, we think the chances are very low that it survived [martian] winter,” McCuiston emphasized to me. “NASA hardware has never been exposed to this type of environment on Mars”. Phoenix landed on the northern plains of the martian artic on May 25, 2008 in a polar permafrost region that proved to be within arms reach of a vast, rock hard layer of frozen water ice. She completed 5 months of intense science, accomplishing break though discoveries at a high northern latitude. She then perished exactly as foreseen when the power output from the solar arrays plunged due to the onset of harsh seasonal weather causing dimming sunlight and bitterly frigid temperatures. At that point there were 17 hours of sunlight per sol (martian day) which are 24.7 hours in duration. Phoenix exceeded her targeted lifetime by over 2 months. An d then the environmental situation turned even more dire. Temperatures plunged steeply to below minus 180 C, there was no sunlight at all for 3 months starting in April 2009 and sheets of carbon dioxide ice built up to perhaps a foot in depth and may have encased the lander at least partially. As a result the electronic wiring likely passed through a “glass transition state” and became brittle and the twin solar arrays might have snapped off. Caption: Holy Cow water ice layer blasted free by Phoenix descent engines visible at top. Mosaic of images in false color stitched from robotic arm camera images. Credit: Marco Di Lorenzo, Kenneth Kremer, NASA/JPL/UA/Max Planck Institute and Spaceflight magazine. See also APOD 12 Nov 2008. I asked Doug about NASA’s go forward plan in the unlikely event that Phoenix arises, “It would probably take a few days at minimum to determine what Phoenix status was, and what may or may not be done with it. Viable plans cannot be generated until the condition of the lander is known, if we hear from it. So producing a plan [prior to contact] would be guesswork at best”. As for how quickly any positive announcement would be made ? McCuiston told me that, “We will go through our regular public affairs process when the project tells us contact was made—that would be very quick, probably the same day”. Of course to accomplish anything meaningful requires money and people. So we next discussed the status of funding available from NASA and staffing from scientists. “The Mars Program held a small amount of contingency start-up funding. Additional funding would be determined based on the condition of the instruments, and the extent and value of the science that could be done”, McCuiston explained. “The science team can be rallied quickly by the PI (Principal Investigator) since all are watching progress”, he added. Peter Smith of the University of Arizona is the scientific Principal Investigator for the Phoenix mission and the same teams spread across many institutions in the US, Canada and several countries in Europe would still be involved. How many scientists can be supported and for how long? “That all depends on the condition of the lander and the instruments”, McCuiston said. Phoenix was an international space exploration mission led by the US and the University of Arizona with project management at JPL and in collaboration with partners from Canada, Germany, Switzerland, Denmark, Finland and Great Britain. NASA has two spacecraft currently circling Mars in near polar orbit which will be actively searching for Phoenix, named Mars Odyssey and Mars Reconnaissance Orbiter (MRO). “We actually listen for it, not try to contact it because of the operational mode it will come up in (if it does at all)”, explained McCuiston. “Odyssey is slated to be the prime communications spacecraft”. The listening campaign with Odyssey begins on January 18 with 10+ overflights per day for three consecutive days, each of which has about a 10 minute window of opportunity, and will continue into February and March. “MRO will search on an as-available basis, depending on what else it’s doing, since its primary role is MSL landing site work. Mars Express [from ESA] is not involved”. MRO does play another very important informational role. “They will try to image Phoenix about every 2 weeks”, McCuiston said. No one I contacted was willing to hazard a guess yet as to whether the two power producing solar arrays are still intact. “So far the MRO images have been very poor due to fog and ice. It probably won’t be very clear until February or later”. So the odds against contact are absolutely daunting. Still we can hope and dream that Phoenix may rise one last time from the ashes and phone home to resume her glorious achievements. If Phoenix is intact, she could potentially remain active as a research outpost for a much longer time period than the first round of 5 months since she is now at an earlier point in the martian year with sunlight increasing each sol. Phoenix final move was to poke the pitch fork like TECP probe into the martian dirt before shutting down. Many Mars scientists believe that the arctic region may be the best place to look for evidence of current life on Mars. Indeed many Phoenix scientists have concluded that the Phoenix landing site is the “most habitable” of any thus far visited by human robotic explorers. The metal phase transition sounds bad. This was one thing which killed Napolean’s Grand Army going into Russia in 1812. This phase transition occurs at a much higher temperature for tin, and the buttons came off the coats of the French soldiers marching in Russia. We can only keep our fingers crossed. Maybe we will get some additional data from Phoenix. I’d like to know how the Lazarus mode works. If power gradually returns, at what power level does it know to begin to boot, and how does it evaluate power level when it has no power to evaluate? Previous PostPrevious Stunning New Views From HiRISE; Plus Big Announcement?